Of course, you will be encouraging your customers to purchase from your online store with attractive deals, discounts, offers and whatnot. Some even go to the lengths of setting a dangerously low margin on their products out of the anticipation of high sales during Black Friday. But it’s never sunshine and rainbows – even with predicted sales. Abandoned carts alone amount to up to 4 trillion dollars per year as of 2018. The big question still remains: How do you convert your visitors to customers during Black Friday? Fortunately, a cart abandonment software like Keptify can help you not only recover lost customers but also re-engage them with your online store to convert them into repeat customers. 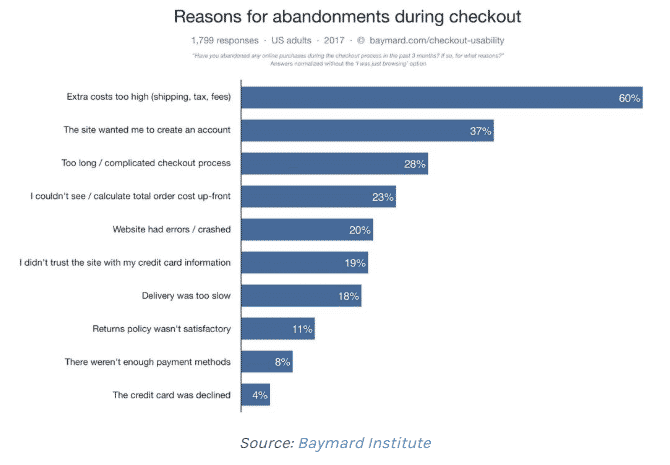 This research by Baymard Institute shows how cart abandonment is caused during checkout. The usual culprits are unexpected costs, poor user experience, technical problems and trust issues. 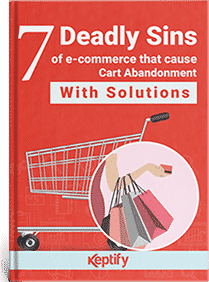 While there are a number of uncontrollable external factors that contribute to cart abandonment, a great cart abandonment software can help you make sure you’re doing your part to keep lost customers’ number to a minimum. Cart abandonment emails have the potential to generate about 14.2% higher order values than promotional emails. This feature of a cart abandonment software can be a game-changer for your online store during Black Friday. Now let’s sprinkle these core aspects of a great cart abandonment email with some Black-Friday-goodness. It does not matter how good your cart abandonment software is if you send retargeting emails without putting any emphasis on the subject line. Use appealing words complimenting your store’s Black Friday sales. You never get a second chance to make the first impression – make sure it counts here. Most online owners usually get the whole ‘limited stock’ idea wrong. In order for this marketing technique to work, you must be offering something that your customers WANT. Use words such as ‘Hurry!’, ‘One time only’, ‘Black Friday Clearance’ and so forth to make it clear that your deals are exclusive for Black Friday and that the stock probably will not last long. If your potential customers do not feel any sense of urgency to buy your product of service, they’ll go somewhere else. Including a simple countdown timer for Black Friday sales at the top of your cart abandonment email can not only create time pressure on your customers but have them buy as many products from your store as possible. When it comes to Black Friday deals, they’re usually too good to be true – to the point some people want to personally contact you to confirm it. Make sure you offer a link to your support team just in case a potential customer wants to get some of their questions answered. Over 40% of Black Friday shoppers use their mobile phone for buying online. It is no surprise that m-commerce is taking the world by storm and your Black Friday campaign is no exception. Provide a seamless buying experience for mobile users by making sure your abandoned cart email is responsive on not just mobile but across all devices. Pop-ups are the perfect way of capturing email addresses of potential leads for your business. 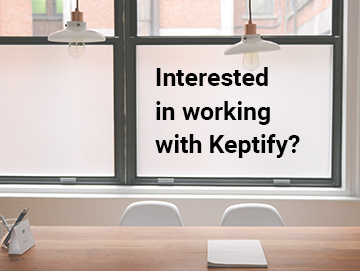 Keptify’s cart abandonment software offers the industry’s best pop-ups with conversion rate of 30%. While some may argue that pop-ups are intrusive, these complains are usually coming from visitors who have to suffer the bombardment of ads. Websites that tend to aggressively show such pop-ups are desperate to get their visitors to view or click on a third party app or they might also be promoting their own products or services. Lead Collection: You can use attractive layovers asking for your visitors’ email addresses so that you can remarket to them in the future. Keep in mind that they’ll want some incentive in return – an offer, discount or anything of value. Social Media Promotion: Want your brand to get more followers on your social media accounts? Use a pop-up to get them to follow you on all the channels. Once you get them to follow you, you can market to them organically with your Black Friday offers. Convert abandoning visitors: Perhaps the most important way of converting abandoning visitors during Black Friday is using layovers with enticing offers to encourage conversion. Again, make sure you’re offering something of value. A great example of this would be offering discount in bulk purchases which is a win-win for both your online store and your customers. Using SMS remarketing for your Black Friday campaign is the most personal and instant way of reaching your customers. Here’s a stunning fact: 90% of text messages get read within 3 minutes of delivery! This goes to prove that compared to any other feature offered by cart abandonment software, SMS is bound to get you results – which means more sales for your Black Friday campaign. Since SMS is the quickest and easiest opportunity to follow-up with your shopper’s interest within minutes, a cart abandonment software like Keptify can help your store’s products and services get delivered straight to your customers’ pockets. Step 3: Abandoned visitors visit your online store and proceed to checkout. Black Friday is one of the biggest online sales campaigns in the world. Your store not only gets loyal customers back but also gets numerous unique shoppers looking for great deals out of the fear of missing out on them. A cart abandonment software like Keptify can help you set up your Black Friday campaigns from creating an effective strategy to continuous optimization of your remarketing. Need help setting up your store to get the maximum results from Black Friday? Contact us today and our conversion experts will help your store get never-seen-before results with our managed service backed with a team of experienced professionals.